Richie rich Tod Newton (Franchot Tone) is out on the town with his equally wealthy friends. They're bored and looking for some amusement. They head to a burlesque show where dancers Janie Barlow (Joan Crawford) and her roommate Rosette LaRue (Winne Lightner) are entertaining the crowd with their moves and a bit of stripping. The police raid the joint and the dancers are arrested. Tod and his friends, not wanting the night to end, watch the courtroom spectacle that ensues. Tod has his eye on Janie and bails her out of jail. He romances her but quickly realize he's in direct competition with her first love, dancing. With his influence and her tenacity, Janie gets a dancing part in Patch Gallagher's (Clark Gable) new show. She's conflicted by her love of dance, her affection for Patch and her sentiments towards Tod and the lavish lifestyle that comes with dating him. Not willing to compete with Janie's first love, Tod tries to sabotage her career by convincing Patch's backer to pull out of the production. Many people lose their jobs, something the wealthy Tod hadn't considered but pains Janie who understands the struggle. In the end, Patch and Janie must find a way to continue on with the show. 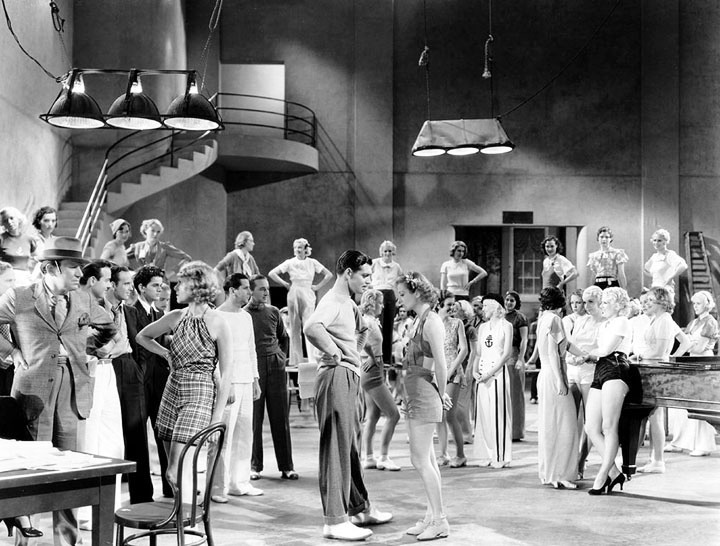 Dancing Lady (1933) is a backstage musical showcasing both MGM's established talent and newcomers alike. It's an experimental film in more ways than one. MGM had the rights to James Warner Bellah's novel, previously serialized in the Saturday Evening Post, and the powers that be saw an opportunity to compete with Warner Bros.'s successful 42nd Street (1933). But first they needed a star. Joan Crawford was Louis B. Mayer and David O. Selznick's top pick for the film. She wasn't a classically trained dancer but was a known hoofer thanks to her dancing in The Hollywood Revue of 1929, Our Dancing Daughters (1928) and Dance, Fools, Dance (1931). According to Crawford biographer Donald Spoto, Crawford was hesitant at first. She only accepted when Mayer offered her an opportunity to be a part of the story development. Even then she almost jumped ship. It wasn't until Selznick sealed the deal with some reverse psychology. He told her she wasn't right for the part saying "I think it's more Jean Harlow's style." There was no way Crawford was going to concede to letting Harlow have the part. Selznick and Mayer sweetened the pot by adding two major MGM stars, both love interests of Crawford's, Clark Gable and Franchot Tone to the film. With their main star secured, MGM faced some difficulties with their two male leads. At first Robert Montgomery was supposed to play the part of Tod Newton but had to bow out. That's when Franchot Tone stepped in. Clark Gable got ill, either with a leg infection or an appendectomy, sources differ on what really happened, and MGM had to keep production going while the Gable was convalescing. Then there were the newcomers. Dancing Lady served as a platform to establish some major talent. First there was Fred Astaire, the only true dancer of any significance in the film. Selznick had his eye on Astaire during his time at RKO and when he moved to MGM he brought Astaire with him. Astaire played himself in what would be his true film debut. And we all know what happened after that. Also in the film are Ted Healy and the Three Stooges. This was before Moe, Larry and Curly broke away from Healy and became the trio we all know and love. Healy plays Patch's assistant stage manager while the Stooges are stage hands whose background gags add some levity to the film. The Stooges are poorly utilized and if you blink you might miss one of their scenes. While this wasn't their first film, it was still early days for the trio and the film helped give them the exposure they needed for their future career. Eve Arden fans will delight seeing her in a bit part as a frustrated actress. Nelson Eddy has his first credited role playing himself. Then there is Robert Benchley, who wasn't technically a newcomer but Dancing Lady served as the start of the MGM career. It was a delight to see Sterling Holloway in an early credited role as the show's writer. On the flip side was then film veteran Winnie Lightner who was reaching the end of her short career in movies. Lightner was an underrated gem of the era and is not given nearly enough of the screen time that she deserved. Dancing Lady is a mixed bag. It suffers from too much going on in the story. The plot would have benefited from some simplification and fewer characters. But if that had been the case we'd miss out on performances from the likes of Arden, Benchley, Lightner, Holloway, etc. Joan Crawford was not really a dancer and it shows. But the role of Janie was as close to the real Joan Crawford as you could possibly get. She was perfect for it. The final show number is lacking in actual dancing. Someone at MGM made the unfortunate decision to have Astaire and Crawford sing. They don't sing as much as they talk to music. Regardless of it's flaws, the film was a success at the box office, earned a profit for MGM, which was no small feat during the Great Depression, and it gave a boost to so many careers. 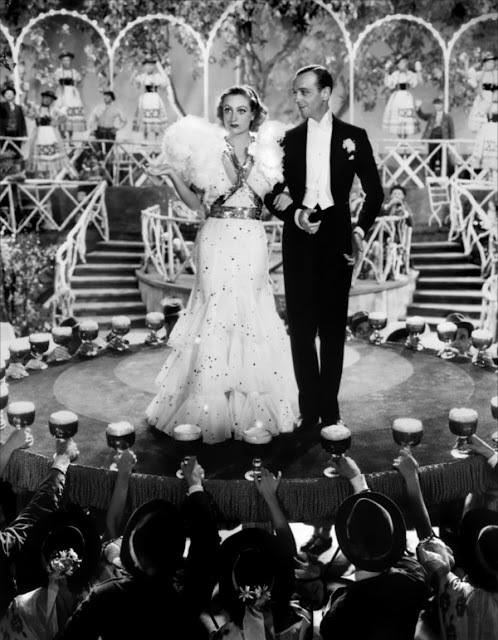 For budding film historians, Dancing Lady is a good study of the mechanics of the studio system. It demonstrates how a major studio like MGM utilized a combination of established stars while also building up new talent. 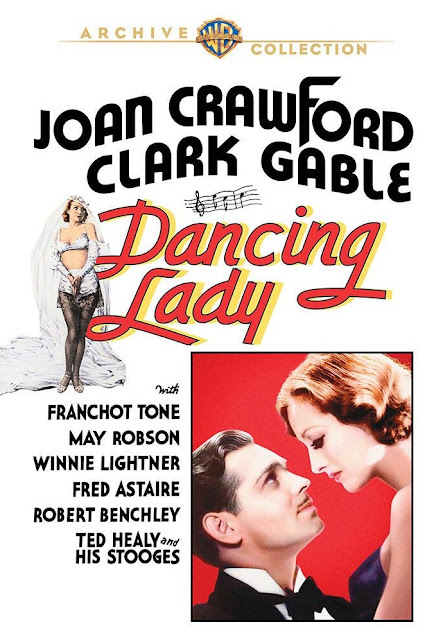 Dancing Lady (1933) is available from the Warner Archive. You can buy the DVD-R from the WB Shop by using this link. Warner Archive Wednesday - On (random) Wednesdays, I review one title from the Warner Archive Collection. Thank you to the Warner Archive for sending me a copy of Dancing Lady (1933) for review!